The Israelites have been traveling for generations. The stories are all through the Torah, stories of loss and despair, stories of feeling like an alien, stories of out and out abuse from their captors, stories of wandering in the wilderness. And, always, there has been a vision of home, a vision of where God is, a vision of where they belong. And so this passage begins with what they know to be: when they come to the land of promise, all will be right. They will be home. But as the passage continues, there is also a calling of what it means to be home, of what it means to be “settled”, of what it means to “possess”. In essence, all of these promises and gifts that God gives come with a responsibility to give back. The meaning of possession here does not seem to be holding but rather entrusting. God gives and then they are called to give in return. The gifts that we are given are not “ours” the way we think of “ours”; rather they are ours to use in forming the world into the vision that God holds for us all. But the passage also lays out exactly what is to be offered to God. It is not the leftovers. It is the first of the fruit of the ground that is harvested. Our modern slang would call it “off the top”. (Yes, even before the federal government!) And the directive is to take it and put it in a basket and offer it as a part of the worship of God. The passage even gives the exact response to be offered: “A wandering Aramean was my ancestor…etc.” I suppose it is an acknowledgment that this land that has been given is not an inheritance the way we have come to think of the word. It is not something that is “due”. Rather, we realize that we are all immigrants, all searching for a place to be. The word “wandering” can also mean “perishing”. In other words, God has raised up the perishing and brought them home. Isn’t that just like God? As we begin this season of Lent, we are called to be aware of all that God has given us. And we, too, are called to respond, to offer our first fruits in thanksgiving to God. I think that we are also called to remember from whom and where we came. The truth is, we are all immigrants, wandering Arameans if you will. And God opens the doors and invites us home. And we are called to do the same. The doors are not ours to close. We do not possess what is behind them. Everything belongs to God. Notice too that the offering is not required immediately upon entering the land. God is not standing at the door to freedom like some sort of holy ticket-taker. Rather, the gift of home also comes with the gift of time—to possess, to settle, to plant, and to harvest. And then, then, with thanksgiving and gratitude, God is to be offered the first of the harvest, the brightest and best. It is a reminder that no one is expected to enter the door fully formed. We are all living on that journey toward who it is God calls us to be. Perhaps part of that journey is a patience toward others as they take the time to do the same. b. What does the notion of being an alien mean to you? c. How do we define “possession”? What would it mean for us to definine it as a “responsibility”? d. In what ways do we miss that feeling of gratitude for all that God offers us? e. What does “home” mean for you? f. What does this passage mean for us in this Lenten season? In this passage, Paul is in the middle of explaining why the gospel does not amount to a betrayal of his own people or a denial of scripture. He claims that this new way of looking at things, this gospel, creates something that produces right relationship and, subsequently, right behavior. It takes further this idea of the commandments, “God’s law”, no longer being external “rules” but rather something that is indeed written on one’s heart. The basis for righteousness, for Paul, is being at one with God. Paul professes that acceptance of Christ as Lord leads to liberation. Essentially, Paul has made the same claim before but, here, he is speaking of a more internalized relationship with God. It is beyond just doing right and living right; it is being one with God. At the end of the passage, Paul affirms the equality of all humanity before God, either Jew or Gentile. Right-standing before God is a gift available to all humanity for the asking. To stand approved before God (to stand justified) is simply a matter of faith. The problem that Paul is countering is that most saw goodness as achieved by obeying the law. They saw their standing as progressed by merit. They could not grasp “perfection” in the sense of Christ. You can actually sense Paul’s frustration. His passionate belief in the Gospel and in Jesus Christ as Savior comes through. But you also get a sense of a certain frustration. He truly believes that the Gospel is open and inclusive of everyone and, yet, he is frustrated that he doesn’t seem to be getting the response that he desires. And yet, he never gives up on the notion that Israel is special, chosen. He cannot imagine that God would ultimately abandon God’s covenant people. God will not just quit loving God’s children. It is apparent that Paul’s image of God is of a Creator who is loving and caring toward all of Creation. Paul is clear that if one professes to be a Christian, than one must openly confess the Gospel of Jesus Christ. And yet, this confession comes without shame. That’s a hard thing for us to fathom. After all, our society thrives on shame. We do not do a good job of letting things go—either ours or others. Paul is calling us here to let the shame go and experience joy instead. The notion of God’s love and generosity being open and available to all is a pretty bold statement when you think about it. Many in this world would take exception to that. So does that mean that we are all equal before God’s eyes? Probably not. Perhaps we need to get out of ourselves. This is not a statement about us; it is a statement about God. We don’t make our salvation happen; God does. God is at work in us—ALL of us. This Salvation thing is a hard notion to grasp. So, we don’t have to DO anything? We don’t have to rack up a certain number of points for God to acknowledge our membership is this little club. We just have to ask; we just have to desire God; we just have to confess and believe or believe and confess. (If you notice, Paul, or possibly Paul’s translators, reversed the two.) Maybe it doesn’t matter. Maybe that’s the whole point. God desires that we confess not for God but for us; and we need to believe or there’s really no point to this at all. I don’t think it matters which comes first. (After all, God created both the chicken and the egg!) The point is that it’s offered to all. God comes to each of God’s children in God’s own way. So whatever we confess and whatever we believe that brings us closer to God is probably the whole idea. The passage is a reminder that Jesus did not come to straighten us out on the rules but to invite us home and show us what that meant. Now THAT is something in which I can believe! b. Why is it so difficult for this world to see Salvation as inclusive? c. What does confession mean for you? d. What does belief mean for you? e. How, then, should we look at the “written law”? f. What does it mean to you to profess your “witness”? g. What doesthis mean for you in this Lenten season? In the chapter prior to this reading, Jesus was baptized. The Spirit of God has entered him and he is ready to begin his ministry. It is a reminder of our own baptism and our own calling into God’s work. The writer of Luke then goes into the forty day temptation of Jesus in the wilderness. It says that he was led by the Spirit, the very essence of God. It is his first act of ministry—to become a sojourner, to go to God in prayer, to take a good hard look at his life and his calling. 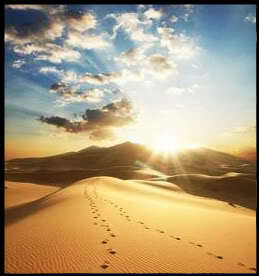 Then Jesus departs into the desert, the place of wildness and wonder. Think about all the stories of wilderness—Israel passing through the wilderness toward liberation. In the same way, Jesus is liberated from the world and we with him. Preparing for this liberation is a journey and involves struggle. For some the struggle is overwhelming. But God is leading us all. During Lent, we often focus on the temptation (the “devil” part of the story). Jesus is tempted where he is most vulnerable. He is tempted to guarantee having what he needs, to shift attention away from purpose. He is tempted to possess. Think about how famished Jesus really was. All Jesus has to do is say the word and he would have what he so desperately needs. Then, he is tempted by his desire of affirmation by God, the desire to impress. We all want to be liked; we all want to be validated. After all, he was just beginning his ministry…this would be a guarantee that they would LIKE him. Finally, he was tempted with the desire to be in control or to have glory or recognition. Think what Jesus could do if he had control and glory. Think how much more powerful his ministry would be. Henri Nouwen says that the temptations are to be relevant, spectacular, and powerful. The truth is that Jesus was human and was tempted by typical human temptations. It is what we all want. Fred Craddock says that “temptation indicates strength”. (Boy, I am strong!) And, yet, we are often uneasy with the whole idea of Jesus being tempted. After all, he was Jesus. He should have been above all that, right? Each temptation invites Jesus to turn away from trust in God in a different way. So maybe this wasn’t about the temptation at all, but was rather a lesson in trust, in perseverance, in resistance of those things that will surely get in the way of our lives. There is an emptiness in all of us that must be filled. We are met each and every day with offerings of things with which to fill it. Jesus affirmed that, yes, we would be met with these temptations, and, that, yes, God’s deepest desire is that our emptiness be filled with God. To be Christian or, actually, to be human, is to realize that that emptiness will never be filled without God. It is that for which it is made. And, really, what good would Jesus have really done us if he had been above it all, if he had never be tempted at all? Where would we be then? Jesus did not come to be a superhero above all that comes about; Jesus came as a human—as a you, as a me. Jesus came not so that we would be perfect but so that we would see what we were missing. After all, being relevant, or spectacular, or powerful are really overrated. Relevancy is short-lived; “spectacularness” is hard to maintain (after all, don’t you sometimes just want to go around in your warm-ups with no makeup? ); and, as Lord Acton would tell, us, “power corrupts”. Jesus wasn’t showing us how NOT to be tempted; Jesus was just putting relevancy, spectacularness, and power in their proper places. Because, after all, when they’re gone, God is still waiting for us to return home. But looking at it this way, the desert becomes the threshold through which we journey. It is a time for preparation, a time for readying oneself to claim who God calls you to be—God’s beloved child. And the only choice one has is to repent, to turn around, to change, to turn toward God. Now, our version of the wilderness is sometimes very difficult to grasp. In our world of perfectly manicured lawns and perfectly coiffed houses, we usually do everything in our power to avoid wilderness in our lives. Wilderness means to us some sort of deprivation and, thus, a loss of power. We do everything we can to see that our lives stay exactly where we want them. We take a pill when we have a pain. We use cosmetics so that we won’t look our age. And who of us would ever be caught without access to a telephone? The wilderness is the thing that we are always trying to avoid. The wilderness does not fit into our carefully thought-out plans. Jesus did not see deprivation but, rather, an emptying of himself before God. In fact, if you think about it, Jesus’ baptism propelled him into the wilderness. Maybe that’s our problem. Maybe we missed our wilderness. Maybe we missed our emptying. This emptying brings us in touch with what we really need—and nothing more. Without our pills and our cosmetics, our cell phones and our online calendars, we are vulnerable. Thank God! For when we are powerless, when we are vulnerable, where do we go? We look to the only place we know. Because even we, who are normally so in control of our lives, must look to the compass if we do not know the way. And there, we become acutely aware of God’s ever-presence. It is only when we have truly emptied ourselves that God can fill us with God and there we are nourished and fed by those things for which our souls truly hunger. From this we can grow in God’s spirit. That’s what Lent is—it’s a pilgrimage through an intentional wilderness. These forty days are our emptying time—the time when we strip all of our preconceptions away and meet God where God is—right there with us. We do not walk this road alone. God is always there. And when we are tempted to once again take control, God will still be there. Lent is the time when we allow God to work on us that we might burst forth on Easter morning in radiant bloom. It is a time of journeying toward home. b. What does temptation mean for you? c. Are you bothered by the notion of Jesus being tempted? d. What does this say to you about your own Lenten journey? e. What is uncomfortable about this whole image of the wilderness? f. What does the wilderness image mean for you? Those of us who walk along this road do so reluctantly. Lent is not our favorite time of year. We’d rather be more active—planning and scurrying around. All this is too contemplative to suit us. Besides we don’t know what to do with piousness and prayer. Perhaps we’re afraid to have time to think, for thoughts come unbidden. Perhaps we’re afraid to face our future knowing our past. Give us the courage, O God, to hear your word and to read our living into it. Give us the trust to know we’re forgiven, and give us the faith to take up our lives and walk. Amen.